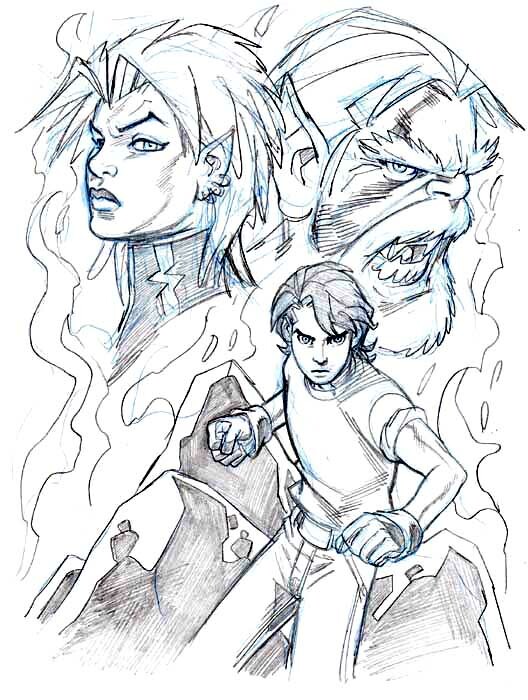 August 2005 - The Official Webpage of Mike Wieringo! archive ¦ The Official Webpage of Mike Wieringo! …Why an anthropomorphic bear in an aristocrat’s clothing from the Elizabethan era….? Because I love drawing ‘funny animals’ and wish that there were more comics like that done here as they are in Europe. Because I think that ‘cartoony’ work can be done for serious and hard-hitting stories as well as humor and comedy. Because the superhero genre practically dominates the comics industry except for a few bright shining pockets of variety from folks like ONI, SLAVE LABOR, IDW and a handful of others. Because the trend toward ‘photorealistic’ comics is a disturbing one to me that I hope doesn’t push out imaginative, playful, idiosyncratic and stylistic forms of comic book art. Because the more amazing European artists I discover, the more I wish that material was the norm here in the U.S. (don’t get me wrong– I love superheroes, too…. just not as the ONLY kinds of comics being done). Mostly, though– because I can…. and it’s fun. Posted in Uncategorized | Comments Off on WHY…..? It’s no secret that I love animals. Especially cats and dogs. And while it’s fun to draw cats, as they’re beautiful and sleek creatures, and I’ve always had cats as companions (not only because they’re such wonderful, loving animals, but they’re also much less ‘high-maintenance’ than dogs are)– I’ve always enjoyed drawing (and looking at) dogs much, much more. No offense meant to my much beloved little cat Charlie, whom I think is just gorgeous (I’m a biased Pop, of course)– but for sheer character and variety of expression, dogs have it all over cats. Some dogs are more expressive than others; for instance, a Golden Retriever is probably one of the most expressive of all canines. You can almost read their mind just by looking at their face….. it’s just amazing. 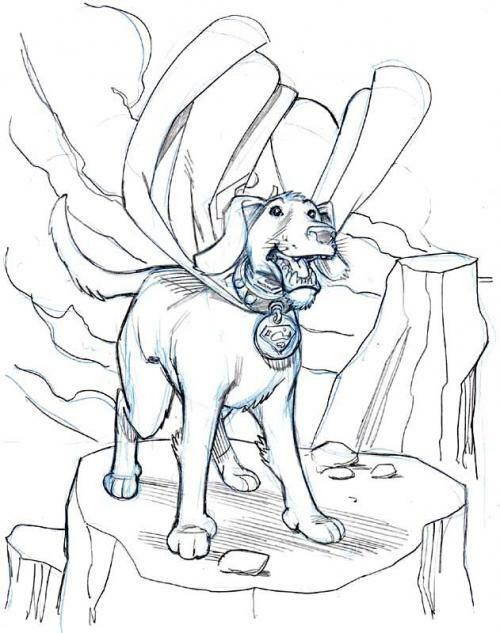 And so dogs make for fun drawing material, and one of my favorite comic book dogs is KRYPTO. Of all of SUPERMAN’S veritable zoo of animal sidekicks from over the years, KRYPTO is the one that has stood the test of time and struck a chord with SUPERMAN fans. One of my favorite recent KRYPTO appearances was in issue 91 of DC’s SUPERBOY book from 2001. It was an aftermath issue of the WORLDS AT WAR storyline that ran through the SUPERMAN family of books. That crossover, in and of itself, was rather forgettable, but this particular issue of SUPERBOY, written by Joe Kelly and drawn by the amazing Pascual Ferry, was a wonderful story. It followed SUPERBOY, GUARDIAN, and (of most interest to me) KRYPTO, each in individual stories, as they deal with mopping up operations in the battle for Earth and its inhabitants. It was a very touching issue that dealt with all three heroes– but I loved the spotlight that it put on KRYPTO’S bravery, loyalty and tenacity. It’s a wonderful comic book, and I’d recommend everyone seeking it out. It’s not necessary to have read the rest of the crossover issues to appreciate the sentiments put forth in this story titled ‘WAR LETTERS’. It stands on it’s own. I used to tell then SUPERMAN Group Editor Eddie Berganza when I was working on ADVENTURES OF SUPERMAN that I’d love to do a KRYPTO mini series. I don’t think he ever took me seriously when I would suggest it. Some times he would just chuckle…. or sometimes say something like “Yeah…. maybe one day we can do something like that.” But I was serious then, and I’m STILL serious. I’d love to one day draw a KRYPTO mini series. He’s a great, noble character who deserves his own comic book. ≡ For the HELL of it…. Today’s sketch is of Mike Mignola’s terrific HELLBOY character. I’ve always been a HUGE Mignola fan, and I have, over the years, bought everything of his that I’ve come across. From his (I THINK) first major work on ROCKET RACOON through his FAFHARD and the GREY MOUSER and IRON WOLF work…..and who can forget his amazing stuff on the COSMIC ODYSSEY with Jim Starlin writing….? That is one of my favorite comics of all time and I treasure the trade collection I own from that classic. And I couldn’t fail to mention the fill-in issue of X-FORCE he did, which was the best issue of that comic in its entire run (although the legion of Liefeld fans howled about how much they hated it….!). Mignola always seemed to me to be a journeyman– always doing mini-series, specials, one-shots and short stories; I suppose anything that struck his fancy and he thought he could have fun with. But whatever he did, I bought. And it was fun to watch his style evolve and pare itself down over the years. Mignola seemed to be searching for the optimum way to tell the most with the least amount of line. But his rich use of black areas created a mood in his work that was stunning. With that character, came the culmination of everything that Mignola was probably searching for in comics as subject matter and inspiration. It’s only fitting that it came from his own imagination and sense of creativity. And the amazing thing is that as minimal as his work had become– Mignola managed to continue to push that boundry, all the while increasing the sense of mood and horror with each story. HELLBOY has been a joy to behold as it has spilled forth from Mignola’s imagination over the past years. It was an instant hit with fans– and as was probably inevitable, it spawned lots of merchandising and eventually a movie. And as Hollywood has discovered Mignola (he also was a huge creative force behind Disney’s ATLANTIS animated feature film) over recent years, his output has diminished. The latest two-issue HELLBOY tale entitled THE ISLAND may perhaps be our last look at extensive work from Mignola for some time to come. 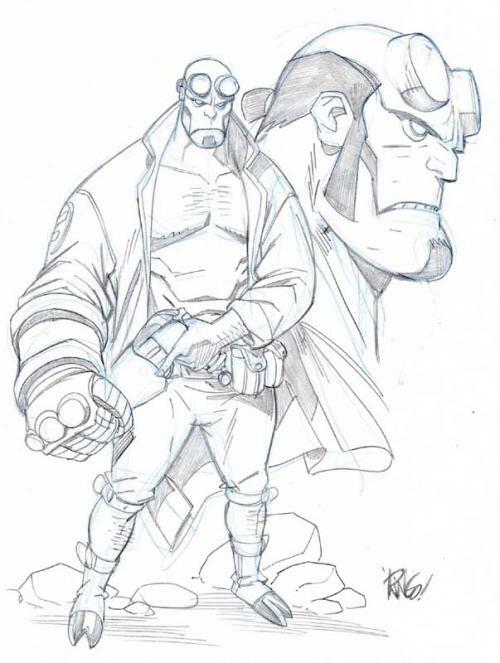 In the letters page of the first issue, the editor states that future HELLBOY tales will be drawn by other artists, with Mignola writing (or perhaps even only plotting). They tell us that Mignola may draw the ocassional short story now and again, but he’s concentrating on other things for now. I suspect that he’s busy working on the SCREW ON HEAD animated project based on his amazingly charming one-shot (how’s that for power….? Do one one-issue story, and get it made into an animated project…?). And I hear there’s a HELLBOY live-action film sequel in the works– and who knows what else he’s got himself involved with in Tinsel Town…? All I know is, he’s going to be busy NOT doing HELLBOY arwork…. and for me, HELLBOY without Mignola drawing him is not something I’m really all that intersted in. I’ll miss regular doses of Mignola. Posted in Uncategorized | Comments Off on For the HELL of it…. WING was a concept that I was formulating years back for a possible creator-owned project that, like SO MANY of the ideas that I come up with, I never got around to actually doing anything with. I’m not even clear on what the details of the story were. It had something to do with a young kid who’s father was a multi-billionaire corporate tycoon, and the kid (named WING, for some reason….. I don’t think he was Asian) finds out that his dad is really the front man for an invasion force from another dimension. And at about the same time he finds this out, his latent powers (just enhanced strength and durability, I think…) manifest themselves, and he confronts his father in a knock-down drag-out brawl. This discovery and confrontation triggers an early start to the invasion, and WING, after having trounced his dad, has to then track down an destroy any and all of the invaders from this other militant dimension. 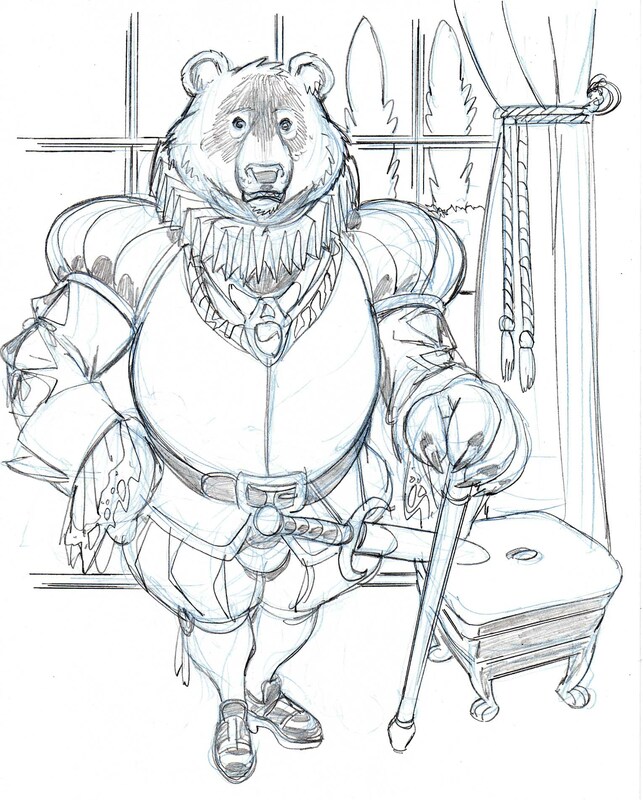 Like I said, I might have gotten some of the details wrong, since I never wrote any of it down (THAT was brilliant….!). I was so serious about it at one point that I used the WING character and one of the ‘bad guys’ from the story in a WIZARD BASIC TRAINING on ‘Movement’ that I did for the magazine. Like I said– I’ve got tons of these old ideas that never made it much farther than a few character sketches and (if I’m LUCKY) a scribbled note or two about it. Not much to talk about today. Just keeping busy. In the post-COMICON/CHICAGO period, there’s actually been very little news to speak of from the comics industry. And not much is going on personally for me other than staying bent over the drawing table, or hunched in front of the computer. 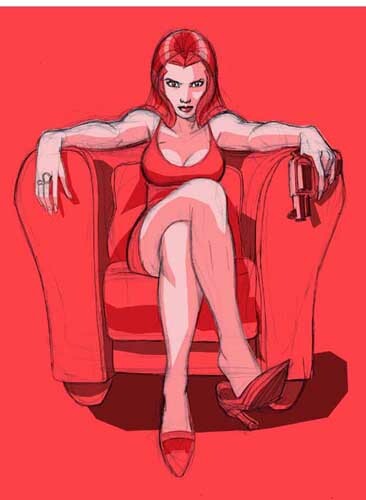 So I’ll just leave you with this Femme Fatale I worked up as a warm up and see you for the next post. Maybe something interesting will have happened by then. Intersting GOOD– not interesting BAD…. I hope. You are currently browsing the The Official Webpage of Mike Wieringo! weblog archives for August, 2005.